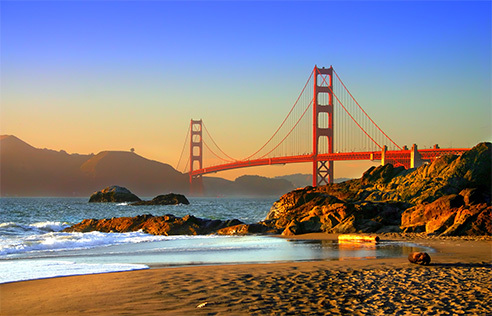 From Bay Area invented technologies, to the beauty and brilliance of Golden Gate Bridge, San Francisco offers more awe-inspiring history, restaurants and farmer’s markets per square mile than any other city in the world. Say goodbye to inhibition and hello to inspiration at the Town House Motel, where you’ll find the best of all things San Francisco often within walking distance. Our knowledgeable staff is on-hand to help you select the best city tours. The Palace of Fine Arts is the centerpiece Landmark of the Marina District and fewer than five minutes away by car from our San Francisco motel. 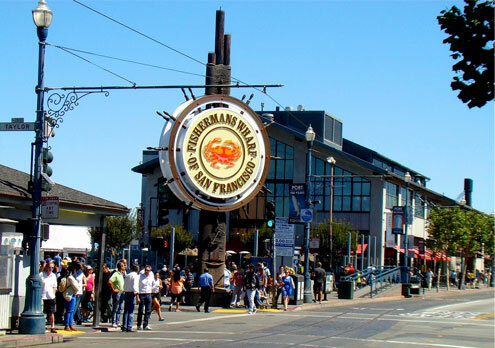 Find a variety of restaurants to suite your dining pleasures at nearby Fisherman’s Wharf. Shop ‘til you drop at nearby boutiques and galleries unique to our area. Enjoy scenic tours of Alcatraz Island, hop aboard a Trolley Car and head downtown, or trade the hustle and bustle of the city for a day trip to Marina Green; rollerblading and biking are a treat along the scenic bay. The Hop-on-Hop off Tour bus stop is right outside our motel. Public bus transportation is one block away. The Town House Motel is a 10-minute walk to the cable car line. San Francisco International Airport is only a 20-25 minute ride south via US 101. The motel is located on famous Lombard Street and is near Union and Chestnut Streets. We are only 3 blocks away from fashionable Union Street with endless options for shopping, dining, chic boutiques and cafes nestled among beautifully restored Victorian homes. Fort Mason Center is just around the corner from our San Francisco Marina District lodging and hosts a variety of events and cultural activities year-round. Experience a diversity of natural and cultural history at Presidio of San Francisco National Park a short 3-minute drive away. Marina Green Park is only a 15-minute stroll from our motel. Crissy Field is a 7-minute drive away via Lombard St and Mason St and offers spectacular views of the northern waterfront, unparalleled recreational opportunities, and the chance to glimpse rare birds feeding on native plants and frolicking in the restored marsh. St. Francis Yacht Club, Letterman Digital Arts Center Lucasfilm, and Walt Disney Family Museum are only 5 minutes away by car.